Philips 46PFL9704 review | What Hi-Fi? Where most manufacturers tend to announce and launch their new telly ranges in one great push, Philips has a much more staggered approach. That's why the 46PFL9704, though theoretically one of 2009's sets, didn't make it to our shores until our April 2009 issue, and will continue to be available until its replacement arrives in around October. 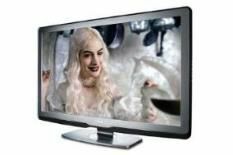 Since its original First Test we've been keen to put the Philips up against its new rivals, and now we have, we can confirm that, while it remains an excellent premium TV, it's no longer the very best in its class. It is, however, still the best-looking. Others are slimmer, but none is as stylish or as solidly built. Besides, that extra thickness is a result not only of a full-array LED backlight, but also of three-channel Ambilight, which projects the colours from the edge of the screen onto the wall behind. It's a feature we're very keen on, as it adds extra perceived depth to images, making 3:10 to Yuma's awesome scenery shots more epic and enveloping. Given Philips' track record it's no surprise that the 46PFL9704 also proves to be one of the punchiest and sharpest performers with this Blu-ray transfer. The faces of Russell Crowe's band of outlaws are as weather-worn and craggy as they should be, and the regular fire-fights benefit from the accomplished contrast levels. The new competitors do highlight a couple of areas in which the Philips could improve, though. Blacks look deep, but there's not as much insight into them as offered elsewhere, so the last few details can be lost in dark corners. It's also fair to say that, while many manufacturers are more than competent in terms of motion processing, this Philips is a little further behind. There's occasionally a touch of smear to horizontal pans, and it doesn't quite grip fast action as well as the best. Of course, the 46PFL9704 is still impressive – you can add excellent stability and detail retrieval from standard-def DVD and Freeview to its list of accomplishments. What's more, it's still the best-sounding flatscreen in its class, with weight, detail and directness that its rivals just can't match. Overall, though, there are now alternatives that just pip it to the top.